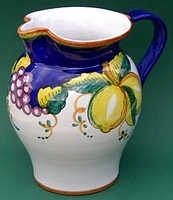 The Frutta Vincent Italian Ceramic pattern consists of a dark rich cobalt blue with lemons, grapes, leaves and accents. This pattern has a summer coastal feel. Shop & compare our artisan Frutta Vincent ceramics, which are hand painted and directly imported from Deruta, Italy by our company.